This past spring, one of my Madronas bloomed profusely. This was a rare event for my trees and a bit exciting to see. Now the tree is loaded with clusters of berry-like fruits. At the moment, they are yellow to green in color and the size of large peas. Eventually, they will swell further and turn bright red. This is the source of the tree's nickname, "Strawberry Tree." The fruits should last into December, provided the birds don't get them first. It will be interesting to watch how this progresses. 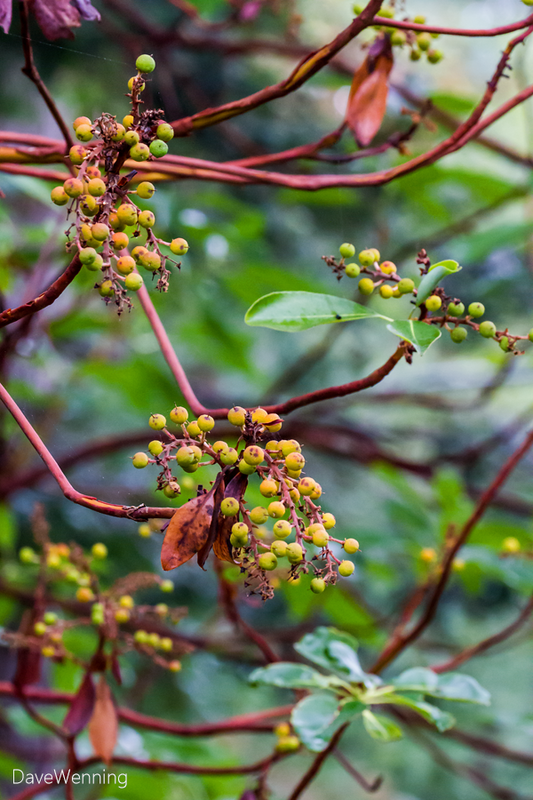 Madronas also go by the name Madrone, and in Canada they are called Arbutus. They are members of the Heath family (Ericaceae) and related to rhododendrons, Kinnikinnick and Salal. This is only the second time I have seen blossoms on my own trees, and the first time any of them have borne fruit. They are almost impossible to transplant. Feel lucky if one springs up naturally in your garden. The secret to growing Madronas is to do pretty much nothing. By all means, don't water or fertilize them. If you have one come up in your garden, just leave it alone. Madronas have an intimate relationship with fungi around their roots. These mycorrhizae help take care of their needs. If you do something that damages the fungi, the tree will die. I have done some pruning on mine and they seem to tolerate that. When small, the trunks and branches can be carefully shaped and bent as with bonsai. As the trees grow, however, the wood becomes as rigid as steel. The Pacific Madrona (Arbutus menziesii) is my favorite tree. They grow naturally in sculptured forms as if pruned for a Japanese garden. They are beautiful evergreen specimen trees that look good year around. They also look good in the understory of large conifers. Madronas become hubs of wildlife activity. Several insect species are attracted to the trees' resources. This brings the birds who feed on the insects. Mine always seem to be full of Spotted Towhees and Chestnut-backed Chickadees. Now the fruits will become another wildlife attractant. Seeing one of my trees bearing fruit is like getting dessert. In all my years, I have never seen Madrona fruits, so this is exciting. I can't wait to see how they turn out. Madrones (that's what I call them) are one of my favorite trees. You're lucky to have these trees in your yard, for sure. and good job on the photos! I love madronas! (That's what I grew up calling them, although some of my Northwest friends call them madrones...). This spring I saw many in bloom when I did a Memorial Day weekend kayaking trip in the San Juans, they were marvelous. I was saddened some years ago when the lovely row of madronas on 8th Ave NW near my home in Ballard/Crown Hill mostly died after a hard winter. They ended up taking the rest out. I heard from some plant expert recently that they rarely grow inland more than 3 or 4 miles from the sea, but there is a healthy, huge madrona growing close to Northgate, must be about it's limit from the Sound. Thanks for your cool blog posts, I always learn something. Ivan,Jill, thank you for stopping by and for the very kind words. Much appreciated. I was lucky enough to have about 15 Madronas growing wild at the bottom of my yard. (Location: Vancouver WA on a hillside) I've planted about 40 more since last fall after I bought the house and only had a couple die. The rest are doing well. The ones with lots of sun grew as much as 2 feet this summer and the ones with not much sun only grew about 1/2 a foot. I think a fairly shady spot is fine for them, they will grow slowly and spindly but I find that look attractive. Because they will block my view if I let them get taller than about 12-15 feet I will be aggressively pruning them to encourage them to grow more sideways than vertical. I will be doing that on the new ones after they are only 2-3 years old. I think it should be possible to avoid the unsightliness of "tree topping" to preserve a view by pruning years BEFORE the tree starts to grow into your view. By the way: You hardly ever find these at retail nurseries. The first one I believe I have ever seen at a retail nursery was one I saw at Portland Nursery the other day. Why do nurseries not carry these? Apparently because they are so difficult for the nurseries to grow. Fortunately there ARE places you can buy these. The first good source I found was Woodbrook Native Plant Nursery in Gig Harbor WA. That was a long drive; later I found they have them at Watershed Garden Works, a native plant nursery in Longview WA. They sell them in gallon size pots for $12 retail. The ones from both nurseries have done very well. The ones that Woodbrook has I don't believe they grow themselves but rather they get them from a commercial nursery. The ones at Watershed they grow themselves. The ones at Watershed are fairly small plants but mine have grown extremely well. 1 gallon seems to be an ideal size for a potted Madrona to transplant into your yard. Although it apparently is a challenge to grow these from seed (hence the reluctance of nurseries to carry them), I have found that planting them out of pots and into the yard, it is NOT difficult to grow them. The guy at Watershed advised me that I may need to give them some water even the second summer after I plant them, but after that they should require absolutely no care, except in my case I will be doing some pruning. They seem to have to have ideal conditions to flower. I only had one that flowered this year. I think that the others didn't bloom because of too much shade or because I pruned them. Ones in a reasonably sunny spot I expect will flower after I have left them alone for a few years. By the way: It is interesting the regional difference as to where these are referred to as "Madrones" versus "Madronas". I believe wiki says they are called "Madrones" south of the Siskiyous. 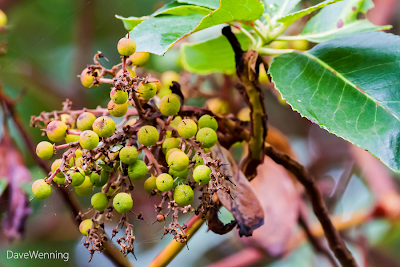 However, people seem to call them "Madrones" slightly more than "Madronas" here in the Portland, OR area. Olympic Peninsula, San Juan Islands, clearly there people call them Madronas, no ifs ands or buts. I guess I'm in the middle zone where you get to choose what to call them; I like the sound of "Madrona" better. They probably also have to reach a certain age before they flower. The wild ones in my yard that flowered is about 7 years old, but I suspect they start flowering at an earlier age than that. I love Madrona! I live in the Willamette Valley of Oregon, several miles from the state capital. I have always been fascinated with the tree for how different it is from every other tree in the area. It's like a tropical tree in the middle of a temperate climate! I love the smooth bark that peels and as a side bonus that I came to appreciate as an adult, the wood burns super hot. I wanted to make it into a bonsai tree when I was a teenager but was supremely disappointed when I found out how picky they are to have their roots messed with. They grow so wild around here that they are almost a weed, if it weren't for the fact that I love every sapling that pops up. And we don't even have the most per capita of Madrona in the state. That award would have to go to southern Oregon, around Medford. They are so prevalent there that it may be the only Madrona Savannah in existence. We also have some monster specimens on our property. One is somewhere around 70 feet tall and has an upper story that is so full of biomass that I wonder if it has its own ecosystem up there. And another one just off of the property has the largest Madrona trunk in the county, measuring in at some 15 feet in circumference! 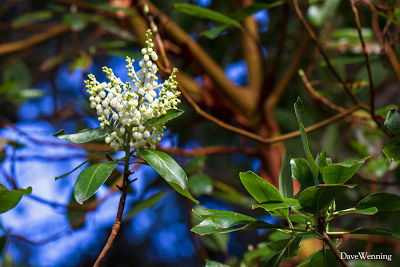 And for the record, I had only heard it called Madrona until I read the wiki page a few years back, and since have found a few that insist on calling it Madrone. Thanks for the cool post about your tree's fruiting and thank you all for your awesome comments.